Instead of the clunky tracks and heads, today’s track lights have many options for both the track itself as well as the size, style, and color of the light fixtures. Tracks are easy to install, even when remodeling or redecorating a room since power is usually already available in the wiring of an existing ceiling fixture. 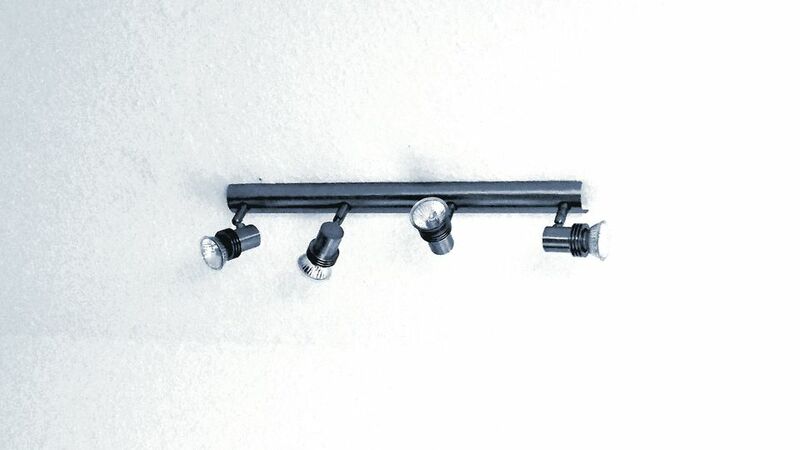 Track lights are perfect when you want to accent objects with light or work under a directional task light. Lights can be aimed at any artwork, countertops, walls, or other room features as needed, making them infinitely useful if you like to change your furniture or artwork around from time to time. Go with white fixture heads to blend into a ceiling or make a statement with black or silver heads. Tracks are especially handy when a room has an existing electrical box in the ceiling yet needs additional light directed throughout the room. For example, install a track in an older kitchen or home office when you can replace an outdated ceiling light with a track that aims light right where you need it—on work surfaces and into pantries or closets. Run a straight track along a hallway ceiling and aim fixtures at the artwork on either wall. Customize a track to fit your kitchen space. A U-shaped configuration may allow you to place light right where you need it—over an island or onto the countertops. Consider installing a track to highlight a large collection of artwork hung over a mantel or on a wall since the heads can be adjusted to point to specific areas of the display. A track installed in a dark closet will let you position a number of heads right where you need light—on clothes or shelves. Track lighting is specialized lighting and is not designed for use as a general light in a room. Rooms with low ceilings are not good candidates for track lighting since the heads hang down from the ceiling and could present an obstacle. Finally, consider other lighting alternatives for spaces that are decorated very traditionally or formally, where track lighting may have too contemporary a look. Get advice from an experienced electrical salesperson on what parts are needed for a track lighting installation in your space – including connectors, heads, tracks, and other parts. In some local areas you may be required to obtain building permits to upgrade lighting, so check to make sure. If this project is too advanced for your skills, have your new track lights installed by a qualified electrician.